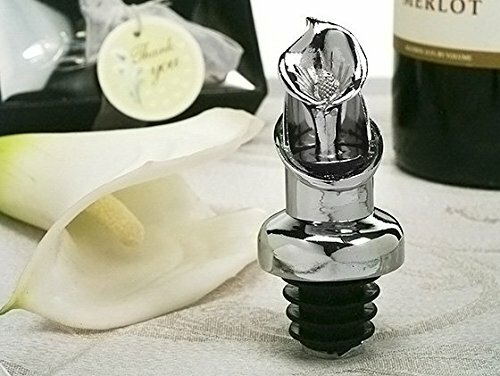 Impress your guests with these unique combination Wine pourer, wine stopper favors. Each elegant Solid chrome metal Wine pourer is adorned with a graceful Calla lily design stopper. These favors will dazzle your guest every time they sit down to enjoy their favor vintage. Best of all they come ready for gift giving in a elegant black velvet lined gift box, and finished with an organza ribbon and Calla lily theme thank you tag. They measure 3.5in. tall. Sold in a pack of 60 pieces. 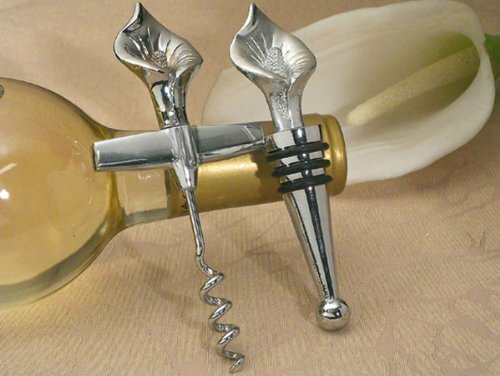 Impress your guests with these unique combination Wine pourer, wine stopper favors. Each elegant Solid chrome metal Wine pourer is adorned with a graceful Calla lily design stopper. These favors will dazzle your guest every time they sit down to enjoy their favor vintage. Best of all they come ready for gift giving in a elegant black velvet lined gift box, and finished with an organza ribbon and Calla lily theme thank you tag. They measure 3.5 tall. ... It makes for a great and unique gift for your wedding reception, bridal & baby shower or any other special event. NOTE: This item is shipped directly from our provider and it usually takes 5-7 days to leave the warehouse. 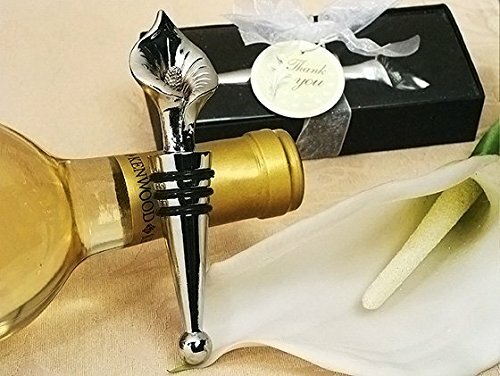 The Calla lily has become a classic wedding flower, and these wine stopper favors are the perfect compliment. 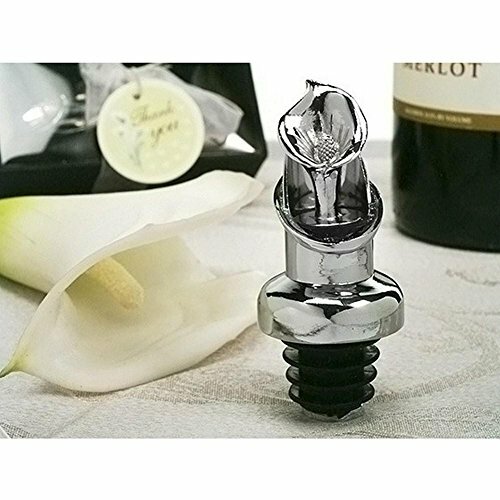 Each solid chrome wine stopper is accented with a graceful chrome Calla lily flower top. Your guests will be reminded of your special day every time they open their favorite vintage and top them off with these stoppers. Best of all they come ready for gift giving in a elegant black velvet lined gift box, and finished with an organza ribbon and Calla lily theme thank you tag. They measure 4.5in. tall. Sold in a pack of 84 pieces. 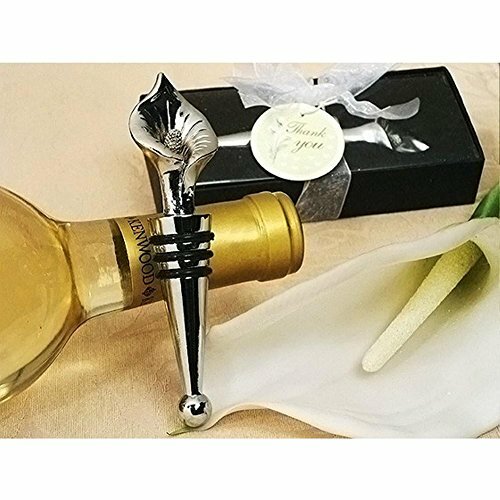 The Calla lily has become a classic wedding flower, and these wine opener and stopper favors are the perfect compliment. Each elegant Solid chrome metal Wine opener and stopper is adorned with a calla lily design top. These favors will remind your guests of the perfect combination you are every time they sit down to enjoy their favor vintage. Best of all they come ready for gift giving in a elegant black velvet lined gift box, and finished with an organza ribbon and a calla lily theme thank you tag. Each measures approximately 4.5 tall. ... It makes for a great and unique gift for your wedding reception, bridal & baby shower or any other special event. NOTE: This item is shipped directly from our provider and it usually takes 5-7 days to leave the warehouse.